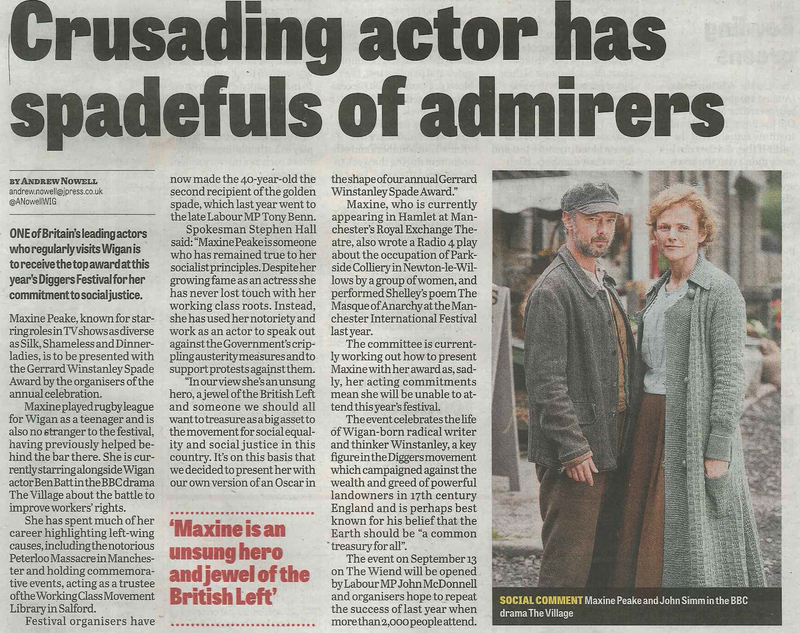 Maxine Peake on receiving the Wigan Diggers’ Festival Award on 07/09/14. On Sunday local award winning actress Maxine Peake, who is currently playing the lead role in Shakespeare’s Hamlet, at the Royal Exchange Theatre in Manchester, was presented with this year‘s “Gerrard Winstanley Spade Award” presented annually by the Wigan Diggers’ Festival committee. The accolade is for her “outstanding contribution to the cause of making the Earth a common treasury for all” in the spirit of Winstanley and the Diggers’ movement, and follows on from another recent award to the locally born actor, by Bolton Socialist Club, for her “outstanding contribution to Socialism” in the shape of a Honorary Life Membership of the club. Appearing on the BBC’s Culture Show last year, Maxine — known for her roles in Silk, Shameless, Dinnerladies and The Village, and who is the holder of a Broadcasting Press Guild Award — spoke of the influence of her grandfather’s left wing politics, and how these helped shape her view of the World. Last year, she also wrote and performed in a play on Radio 4 about the occupation of Parkside Colliery at Newton-le-Willows by women led by Anne Scargill back in 1994. Speaking on behalf of the Diggers’ committee, their media spokesperson Stephen Hall said: “Maxine Peake is someone who has remained true to her socialist principles. Despite her growing fame as an actor, she has never lost touch with her working class roots. Instead, she has used her notoriety and work as an actor to speak out against the government’s ‘crippling austerity measures’, and to support protests against them. “She has also helped in recent years, to revive interest in the annual Peterloo Massacre commemoration event in Manchester, is a Trustee of the Working Class Movement Library in Salford, and supports numerous other progressive causes. 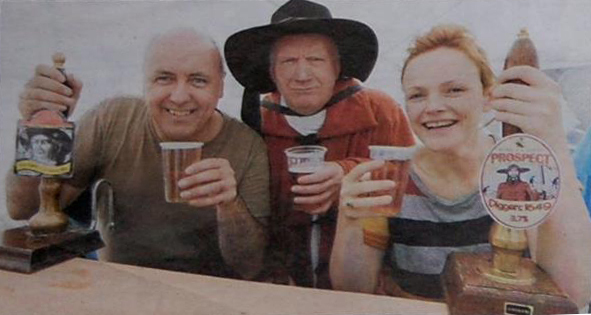 She even worked as a volunteer and served behind the bar at our second Diggers’ festival” (shown below) Mr Hall said. “In our view she’s an unsung hero, and a jewel of the British Left, and someone we should all want to treasure as a big asset to the movement for social equality and social justice in this country. “It’s on this basis, and her absolutely fantastic and much acclaimed reciting of Percy Shelley’s poem “The Masque of Anarchy” (written shortly after the Peterloo Massacre) at last year’s Manchester International Festival, that we decided to present her with our own version of an ‘Oscar’ in the shape of our annual Gerrard Winstanley Spade Award, the first ever one of which we presented to veteran Labour MP Tony Benn last year. “Sadly, Tony is no longer with us, and is a huge loss. We’re hoping Maxine will be around for very many years to come.” Mr. Hall said. 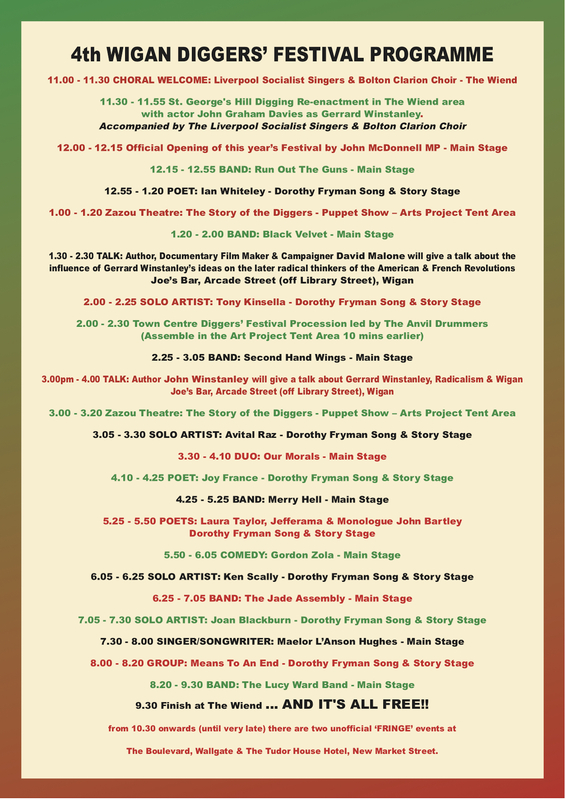 This year’s festival site map, providing a guide to stall holders, the location of activities and various site amenities. 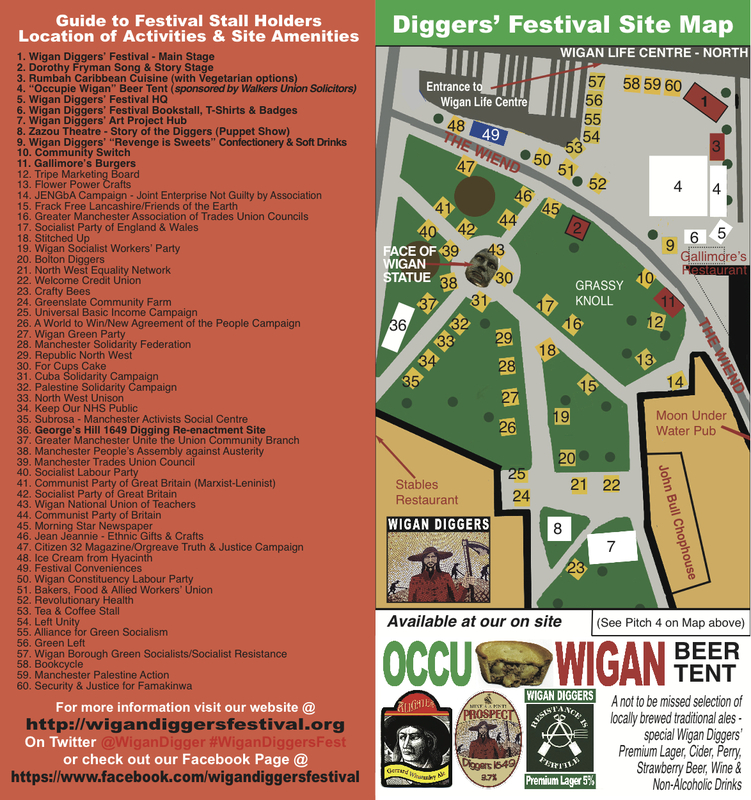 Note for stallholders: please report to the Diggers’ Festival HQ Tent on arrival, which should ideally be before 10.00am on Saturday, and BEFORE setting up your stall. 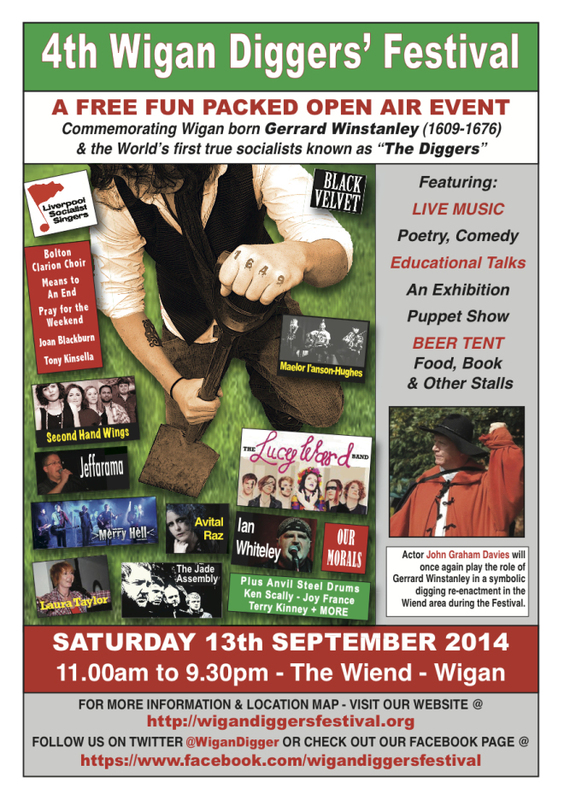 The organisers are promising another free all day fun packed open air event to commemorate Wigan born Gerrard Winstanley (1609-1676) and the 17th Century “Diggers” (True Leveller) movement. Winstanley and they famously asserted: “The Earth was made a common treasury for all, irrespective of person!” and are described by Tony Benn as “the first true Socialists”. Last year’s festival was another resounding success with over 2,000 people attending during the course of the day. We hope this year’s will be too.